We have measured and characterized, over a wide range of doping levels, the UV-near-IR (190-2000-nm) absorption properties of Ti:sapphire crystals. We find that the strengths of absorption centered around 400-450 and 268 nm depend on the square of the Ti3+ doping level, suggesting an origin from pairs of Ti3+ ions. In addition, we have identified an absorption feature below 210 nm due to Ti3+, rather than Ti4+ charge-transfer transitions. Finally, our data on 800-nm-peak, near-IR absorption shows a complex lineshape, with a lower limit set by Ti3+ pair absorption. Thus the maximum possible Figure-of-Merit for Ti:sapphire reduces as the doping level increases. Solid State Research Report (Lincoln Laboratory, MIT, 1982:3), pp. 15–21. “Titanium-doped sapphire: A new tunable solid state laser,” in Physics News in 1982, P. F. Schewe, ed. (American Institute of Physics, 1982). D. S. McClure, “Optical spectra of transition-metal ions in corundum,” J. Chem. Phys. 36(10), 2757–2779 (1962). B. F. Gachter and J. A. Koningstein, “Zero phonon transitions and interacting Jahn-Teller phonon energies from the fluorescence spectrum of α-Al2O3:Ti3+,” J. Chem. Phys. 60(5), 2003–2006 (1974). P. F. Moulton, “Spectroscopic and laser characteristics of Ti:Al2O3,” J. Opt. Soc. Am. B 3(1), 125–133 (1986). P. Lacovara, L. Esterowitz, and M. Kokta, “Growth, spectroscopy and lasing of titanium-doped sapphire,” IEEE J. Quantum Electron. 21(10), 1614–1618 (1985). C. K. Jorgenson, University of Geneva, Geneva, Switzerland (personal communication, 1985). R. L. Aggarwal, A. Sanchez, M. M. Stuppi, R. E. Fahey, A. J. Strauss, W. R. Rapoport, and C. P. Khattak, “Residual infrared absorption in as-grown and annealed crystals of Ti:Al2O3,” IEEE J. Quantum Electron. 24(6), 1003–1008 (1988). T. S. Bessonova, M. P. Stanislavskii, and V. Y. Khaimov-Malkov, “Effect of heat treatment and irradiation on absorption spectra of Ti and Si corundum,” Opt. Spectrosc. 41, 87–88 (1976). B. D. Evans, “Ubiquitous blue luminescence from undoped synthetic sapphires,” J. Lumin. 60-61, 620–626 (1994). a. W. C. Wong, D. S. McClure, S. A. Basun, and M. R. Kokta, “Charge-exchange processes in titanium-doped sapphire crystals. I. Charge-exchange energies and titanium-bound excitons,” Phys. Rev. 9, 5682–5692 (1995) and b. “Charge-exchange processes in titanium-doped sapphire crystals. II. Charge-transfer transition states, carrier trapping, and detrapping,” Phys. Rev. 51, 5693–5698 (1995). J. F. Pinto, L. Esterowitz, G. H. Rosenblatt, M. Kokta, and D. Peressini, “Improved Ti:sapphire laser performance with new high figure of merit crystals,” IEEE J. Quantum Electron. 30(11), 2612–2616 (1994). P. W. Roth, A. J. Maclean, D. Burns, and A. J. Kemp, “Directly diode-laser-pumped Ti:sapphire laser,” Opt. Lett. 34(21), 3334–3336 (2009). P. W. Roth, D. Burns, and A. J. Kemp, “Power scaling of a directly diode-laser-pumped Ti:sapphire laser,” Opt. Express 20(18), 20629–20634 (2012). R. Sawada, H. Tanaka H, N. Sugiyama, and F. Kannari, “Wavelength-multiplexed pumping with 478- and 520-nm indium gallium nitride laser diodes for Ti:sapphire laser,” Appl. Opt. 56(6), 1654–1661 (2017). S. Backus, M. Kirchner, R. Lemons, D. Schmidt, C. G. Durfee, M. Murnane, and H. Kapteyn, “Direct diode pumped Ti:sapphire ultrafast regenerative amplifier system,” Opt. Express 25(4), 3666–3674 (2017). 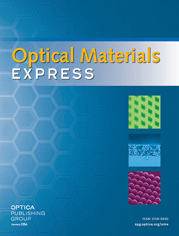 A. J. Maclean, P. W. Roth, D. Burns, A. J. Kemp, and P. F. Moulton, “Pump Induced Loss in Directly-Diode Laser Pumped Ti:Sapphire Lasers,” in Lasers, Sources and Related Photonic Devices, OSA Technical Digest Series (CD) (Optical Society of America, 2010), paper AWB16. R. E. Fahey, A. J. Strauss, A. Sanchez, and R. L. Aggarwal, “Growth of Ti:Al2O3 crystals by a gradient-freeze technique,” in Tunable Solid State Lasers II, A. B. Budgor, L. Esterowitz, and L. G. DeShazer, eds. (Springer, 1987) pp. 82–88. A. Nehari, A. Brenier, G. Panzer, K. Lebbou, J. Godfroy, S. Labor, H. Legal, G. Chériaux, J. P. Chambaret, T. Duffar, and R. Moncorgé, “Ti-Doped Sapphire (Al2O3) Single crystals grown by the Kyropoulos technique and optical characterizations,” Cryst. Growth Des. 11(2), 445–448 (2011). V. S. Konevskii, E. V. Kryvonosov, L. A. Lytvynov, and M. I. Shakhnovich, “Optical absorption of Ticor,” J. Appl. Spectrosc. 50(4), 427–430 (1989). We note the authors use of Ticor for Ti:sapphire could lead to the article not appearing in literature searches. E. V. Kryvonosov and L. A. Lytvynov, “Properties of Ti-sapphire as a laser material,” Crystallogr. Rep. 57(7), 967–973 (2012). S. V. Nizhankovskii, N. S. Sidel’nikova, and V. V. Baranov, “Optical absorption and color centers in large Ti: sapphire crystals grown by horizontally directed crystallization under reducing conditions,” Phys. Solid State 57(4), 781–786 (2015). M. R. Kokta, “Effects of growth conditions and post-growth thermal treatment on the quality of titanium-doped sapphire,” in Tunable Solid State Lasers II , A. B. Budgor, L. Esterowitz, and L. G. DeShazer, eds. (Springer, New York, 1987), pp. 89–93. F. Schmid and C. P. Khattak, “Growth of Co:MgF2, and Ti:A12O3 crystals for solid state laser applications,” in Tunable Solid State Lasers, P. Hammerling, A. B. Budgor, and A. Pinto, eds. (Springer, New York, 1985), pp. 122–128. Czech Republic Patent No. 306,642, US Patent applied for. I. H. Malitson and M. J. Dodge, “Refractive index and birefringence of synthetic sapphire,” J. Opt. Soc. Am. 62, 1405 (1972). The reference is to a paper abstract, with no numerical data. The latter appears in Handbook of Optical Materials, M. J. Weber, ed. (CRC Press, 2003), Chapter 1, p.75. H. H. Tippins, “Charge-transfer spectra of transition-metal ions in corundum,” Phys. Rev. 1(1), 126–135 (1970). C. F. Byvik and A. M. Buoncristiani, “Analysis of vibronic transitions in titanium-doped sapphire using the temperature of the fluorescence spectra,” IEEE J. Quantum Electron. 21(10), 1619–1624 (1985). K. Huang and A. Rhys, “Theory of light absorption and non-radiative transitions in F-centres,” Proc. R. Soc. Lond. A 204(1078), 406–423 (1950). M. de Jong, L. Seijo, A. Meijerinka, and F. T. Rabouwa, “Resolving the ambiguity in the relation between Stokes shift and Huang–Rhys parameter,” Phys. Chem. Chem. Phys. 17(26), 16959–16969 (2015). M. Grinberg, A. Mandelis, K. Fjeldsted, and A. Othonos, “Spectroscopy and analysis of radiative and nonradiative processes in Ti3+:Al2O3 crystals,” Phys. Rev. 48(9), 5922–5934 (1993). S. I. Pekar, Untersuchungen über die ElektronentheorieAkademie Verlag, Berlin (1954). D. Curie, Luminescence in Crystals, translated from the French edition (1960) by G. F. J. Garlick, Methuen, London; (Wiley, 1963), p. 55. S. K. Mohapatra and F. A. Kröger, “Defect structure of α-Al2O3 doped with titanium,” J. Am. Ceram. Soc. 60(9-10), 381–387 (1977). F. Urbach, “The long-wavelength edge of photographic sensitivity and of the electronic absorption of solids,” Phys. Rev. 92(5), 1324 (1953). T. Tomiki, Y. Ganaha, T. Shikenbaru, T. Futemma, M. Yuri, Y. Aiura, S. Sato, H. Fukutani, H. Kato, T. Miyahara, A. Yonesu, and J. Tamashiro, “Anisotropic optical spectra of α-Al2O3 single crystals in the vacuum ultraviolet region. I. Spectra of absorption tail and reflectivity,” J. Phys. Soc. Jpn. 62(2), 573–584 (1993). H. Mahr, “Absorption band shape and Urbach's rule of localized excitons,” Phys. Rev. 132(5), 1880–1884 (1963). R. L. Aggarwal, A. Sanchez, R. E. Fahey, and A. J. Strauss, “Magnetic and optical measurements on Ti:A12O3 crystals for laser applications: concentration and absorption cross section of Ti3+ ions,” Appl. Phys. Lett. 48(20), 1345–1347 (1986). N. Laurance, E. C. Mclrvine, and J. Lambe, “Aluminum hyperfine interactions in ruby,” J. Phys. Chem. Solids 23(5), 515–531 (1962). K. Matsunaga, T. Mizoguchi, A. Nakamura, T. Yamamoto, and Y. Ikuhara, “Formation of titanium-solute clusters in alumina: A first-principles study,” Appl. Phys. Lett. 84(23), 4795–4797 (2004). L. Y. Kravchenko and D. V. Fil, “Defect complexes in Ti-doped sapphire: A first principles study,” J. Appl. Phys. 123(2), 023104 (2018). J. García Solé, L. E. Bausá, and D. Jaque, An Introduction to the Optical Spectroscopy of Inorganic Solids, (John Wiley and Sons, Ltd., 2005), Appendix 4. A. M. Stoneham, Theory of Defects in Solids: Electronic Structure of Defects in Insulators and Semiconductors, (Oxford University Press, 1975), Ch. 10. D. Y. Smith and D. L. Dexter, “Optical absorption strengths of defects in insulators,” in Progress in Optics, Volume 10, E. Wolf, ed. (Springer, 1987), Ch. 5. A. Z. Smakula, “Über Erregung und Entfärbung lichtelektrisch leitender Alkalihalogenide,” Eur. Phys. J. A 59(9-10), 603–614 (1930). W. M. Fairbank, G. K. Klauminzer, and A. L. Schawlow, “Excited-state absorption in ruby, emerald, and MgO:Cr3+,” Phys. Rev. 11(1), 60–76 (1975). K. Matsunaga, A. Nakamura, T. Yamamoto, and Y. Ikuhara, “First-principles study of defect energetics in titanium-doped alumina,” Phys. Rev. 68(21), 214102 (2003). M. G. Brik, “Ab-initio studies of the electronic and optical properties of Al2O3:Ti3+ laser crystals,” Phys. B 532, 178–183 (2018). R. H. French, “Electronic band structure of Al2O3, with comparison to AlON and AlN,” J. Am. Ceram. Soc. 73(3), 477–489 (1990). F. G. Will, H. G. deLorenzi, and K. H. Janora, “Effect of crystal orientation on conductivity and electron mobility in single-crystal alumina,” J. Am. Ceram. Soc. 75(10), 2790–2794 (1992). P. F. Moulton, J. G. Cederburg, K. T. Stevens, G. Foundos, M. Koselja, and J. Preclikova, “Optimized InGaN-diode pumping of Ti:sapphire crystals,” Opt. Mater. Express 9, 2131–2146 (2019). Fig. 1. Absorption spectra vs. wavelength from three samples. Note different scales for regions above and below 300 nm, and scale magnification for wavelengths above 700 nm. Data is pi-polarized for wavelengths greater than 300 nm and unpolarized at shorter wavelengths. Data below 300 nm is from CT2b, with data from CT2a plotted at longer wavelengths. Fig. 2. Absorption spectra vs. wavenumber and energy from three samples also shown in Fig. 1. Three different absorption regions are indicated for discussion. Note the different scale (on the right) for Region 3, and scale magnification for Region 1. Fig. 3. (a) Region 2 pi-polarized absorption spectra vs. wavelength from eight samples. (b) Same data as for (a) but normalized to absorption at 490 nm. Fig. 4. (a) Region 2 sigma-polarized absorption spectra vs. wavelength from five samples. (b) Same data as for (a) but normalized to absorption at 490 nm. Fig. 5. (a) Region 3 unpolarized absorption spectra vs. wavelength from seven samples. (b) Same data as for (a) but plotted with a logarithmic scale for absorption. Fig. 6. (a) Region 3 pi-polarized absorption spectra vs. wavelength from eight samples. (b) Same data as for (a) but plotted with a logarithmic scale for absorption. Fig. 7. (a) Region 3 sigma-polarized absorption spectra vs. wavelength from seven samples. (b) Same data as for (a) but plotted with a logarithmic scale for absorption. The data for samples SY7d and CT2b cuts off at 80 cm-1, the practical limit for our measurement instrument given the sample thicknesses. Fig. 8. Region 3 pi- and sigma-polarized absorption spectra vs. wavelength from two samples, plotted together to provide a comparison. Fig. 9. (a) Region 1 sigma- and pi-polarized and absorption spectra from three samples with relatively high absorption. (b) Same data as for (a) but for four samples with lower absorption. Fig. 10. Pi-polarized absorption for sample UC1a, along with a two-Gaussian fit, with each Gaussian band shown, as well as the difference between data and fit plotted on the expanded right-hand axis. Fig. 11. Sigma-polarized absorption for sample UC1a, along with a two-Gaussian fit, with each Gaussian band shown, as well as the difference between data and fit plotted on the expanded right-hand axis. Fig. 12. (a) Region 2 pi-polarized residual absorption spectra from ten samples. (b) Same data as for (a) but plotted on logarithmic scale. Fig. 13. (a) Region 2 sigma-polarized residual absorption spectra from seven samples. (b) Same data as for (a) but plotted on logarithmic scale. Fig. 14. Plots of pi-and sigma-polarized residual absorption for three samples, for comparison of the two polarizations. Note expanded scale for sample UC1a, on the right-hand vertical axis. Fig. 15. The ratio of pi-polarized absorption for the residual absorption at 400 nm to that of the peak absorption of the high band as a function of the high-band peak absorption coefficient. Data is for 17 samples, sorted and color coded for high-FOM samples from Synoptics (SY) and for all other samples, with the latter further sorted into low and high FOMs. We include linear fits (forced zero origin) to the high-FOM sets of samples, along with fitting parameters and associated R-squared values. Fig. 16. (a) UC1a, Region-3 absorption, scaled Ti4+ absorption, and Ti4+-corrected absorption derived by subtracting the scaled absorption from the data (b) Same data as for (a) but for sample SY7d. Fig. 17. The scaling factor for sample SY1a Ti4+-related absorption, versus the samples’ high-band peak absorption coefficient for both unpolarized and pi-polarized data. Fig. 18. (a) Sample UC1a, Region-3 absorption, Ti4+-corrected absorption, Gaussian fitting to the E-Band peak and the difference between the Ti4+-corrected absorption and the fit. (b) Same data as for (a) but for sample SY7d. Fig. 19. Plot of the percentage difference from unpolarized Ti4+-corrected data and Gaussian fit for E band around the peak, for three samples. Fig. 20. Plot of ratio of the E-band peak absorption coefficient, determined by Gaussian fit, to the high-band peak absorption coefficient. We plot unpolarized, pi-, and sigma-polarized data, along with the characteristics of zero-intercept linear fits. Fig. 21. Log plot of Ti4+-corrected, pi-polarized absorption (solid lines), along with fitted Urbach tails (dashed lines) and one dotted line showing our Gaussian fit (SY7d Gn) to the data for sample SY7d. Also included is data, without a fit, for Ti4+-related absorption in SY1b. Fig. 22. (a) Pi-polarized, Region 2 residual absorption from five samples, with absorption from the tail of the E band subtracted. (b) Same data as for (a) but plotted on a log scale. Fig. 23. (a) and (b). Similar to Fig. 22 but for sigma-polarized data. Fig. 24. Log plot of Ti4+-corrected, unpolarized absorption (solid lines) at wavelengths below 210 nm (deep-UV absorption), along with fitted Urbach tails (dashed lines). Fig. 25. (a) Pi-polarized, 820-nm absorption from samples listed in Table 5 as a function of high-band peak absorption coefficient. Blue solid line is square-law fit to data for all but the labeled sample points. (b) Same as for (a) but with FOM plotted. Blue solid line is inverse-law fit to all but labeled sample points. Fig. 26. FOM vs. the inverse of the Ti4+ scaling factor, for the samples or sample sets indicated. The dotted line is a linear, zero-origin fit to the data for samples CT1a, CT2a, SY2a,d, and SY7b. Fig. 27. (a) Pi-polarized, IR absorption from sample SY2b, with three-Gaussian fit, fit components and difference between data and fit plotted, all as function of frequency. (b) Same data as for (a) but with for sigma-polarized absorption from sample SY7c. Fig. 28. (a) Pi-polarized, IR and visible-wavelength absorption from sample UC3, with fitted low- and high-band spectra, and an IR band determined by subtraction from the data of the fitted bands. Also shown is the difference between sum of the bands and the data. (b) Fitting of IR band to four Gaussian function bands (IR1-IR4) and difference from the fit. Fig. 29. (a) Peak frequencies for IR1-IR3 bands as a function of IR3-band peak absorption, the latter on a logarithmic scale. Data is shown for both polarizations. Solid-fill data points are for Synoptics samples, while no-fill points are for all other sample. (b) Same as for (a) but showing fraction of fitting strength (see text). Fig. 30. (a) Same as for Fig. 29(a) but for linewidth (FWHM). (b) Same as for 29(a) but showing polarization ratio for each band (see text). Fig. 31. (a) Pi-polarized, IR absorption from sample SY1b, with plotted three-Gaussian fit, fit components and the difference between data and fit, all as function of frequency. (b) Same data as for (a) but with for sigma-polarized data, with only two Gaussians needed for fitting. Fig. 32. Simplified energy-level diagrams for isolated and pairs of Ti3+ ions in sapphire. Two calculated energy levels for pairs are shown (a) from Ref. and (b) from Ref. .
Table 2. Wavelength ranges for bands or regions discussed in paper. Table 3. Two-Gaussian fitting parameters for pump band. Table 4. Gaussian fitting parameters for E band, different polarizations. Table 5. Absorption at 820 nm and FOM for selected samples. Table 6. IR3 band (pi polarized) peak absorption for selected samples. Table 7. Comparison of IR band properties, sample SY1b and others. Table 8. Al3+-ion spacings in Al2O3 and calculated results on Ti3+ pairs. Table 9. Oscillator strengths (f) for Ti:sapphire absorption features. Wavelength ranges for bands or regions discussed in paper. Two-Gaussian fitting parameters for pump band. Gaussian fitting parameters for E band, different polarizations. Absorption at 820 nm and FOM for selected samples. IR3 band (pi polarized) peak absorption for selected samples. Comparison of IR band properties, sample SY1b and others. Al3+-ion spacings in Al2O3 and calculated results on Ti3+ pairs. Oscillator strengths (f) for Ti:sapphire absorption features.